Twenty three year old Neal Wanless from South Dakota is the latest Powerball jackpot winner to claim his prize. The winning number for the $232.1 million jackpot was drawn on May 27. Neal bought 15 tickets in Winner, South Dakota and will take home a lump sum of $88.5 million after taxes. His family has been struggling financially for years so this money will be a great help to them. PIERRE, S.D. – It has the makings of a Hollywood script: A young rancher struggling to eke out a living in one of the poorest corners of the nation claims one of the biggest undivided jackpots in U.S. lottery history — $232 million — after buying the ticket in a town called Winner. Neal Wanless, wearing a black cowboy hat and a huge grin, accepted his giant-sized Powerball check at a ceremony Friday. Wanless, who is 23, single and lives with his mother and father on the family’s 320-acre ranch near Mission, said he’s going to buy himself a bigger spread, repay the kindness other townspeople have shown his family and spend his newfound fortune wisely. “I want to thank the Lord for giving me this opportunity and blessing me with this great fortune. I will not squander it,” he said. Wanless bought $15 worth of tickets to the May 27 30-state drawing at a convenience store in Winner during a trip to buy livestock feed. He will take home a lump sum of $88.5 million after taxes are deducted — an astonishing fortune, even more so in rural Todd County, the nation’s seventh-poorest county in 2007, according to the Census Bureau. Arlen Wanless, the winner’s father, has been buying and selling scrap metal to make a living in recent years, but his fortunes dropped with the price of iron, said Dan Clark, an auctioneer from Winner and a friend of more than two decades. Congrats to Neal and his family. Well sort of. A lawyer representing a D.C. couple has come forward to claim the $144 million Powerball jackpot won on April 8. Apparently a lawyer got in touch with lottery officials claiming to represent the mystery couple. But lottery officials would prefer to have the mystery couple claim their prize in person so they can have a big celebration. A D.C. couple has at last come forward to claim the city’s largest Powerball lottery win ever, a $144 million jackpot won more than three weeks ago. But we may never know the identity of the lucky winners, who are exploring legal avenues to protect their anonymity. “An attorney got in touch with us, and we’re pretty legit on this one,” said D.C. Lottery spokeswoman Athena Hernandez. The couple purchased the ticket at the new Giant grocery store on Alabama Avenue in Southeast Washington. The April 8 drawing verified where the winning ticket was bought, but no one knew who bought it. For weeks, the city has been abuzz with talk of who the nation’s newest multimillionaires might be. An attorney finally got in touch with the lottery office this week to claim the winnings on behalf of his clients. Hernandez said the money will be handed over at 11 a.m. on Monday, but the lottery commission and the attorney are still wrangling with details about the handover. “They physically may not come,” Hernandez said. The attorney said his clients want to remain anonymous and are trying to have him claim the prize for them. This is not necessarily what a lottery commission wants. They love the big smile, the press conference, the giant check and dreams made palpable in the form of a real person everyone can relate to. But in many cases, the winners have formed trusts and claimed the prize as an entity, concealing their identities. Attorneys for the D.C. Lottery are working with the winners’ attorney to try and negotiate for their appearance, she said. “We’re trying hard to get them there,” Hernandez said. You know what? I don’t blame the couple for remaining anonymous. In these trying times who wants the whole world to know you’re $144 million dollars richer. Can you imagine the long lost relatives coming out of the woodwork begging for money? Or just regular folks and organizations having their hands out begging for money or donations. Forming a trust and claiming the prize as an entity is probably the best way to go. If you check out the winners page at the Powerball website you’ll see that a few of the previous jackpot winners have formed a trust or L.L.C’s to claim their prize so they could remain anonymous. Anyway congrats to the mystery couple. Posted in: Powerball	| Tagged: D.C. Lottery, Giant Food, life, money, Powerball Lottery, Washington D.C. The opening of a new Giant two years ago in Ward 8, after nearly a decade without a grocery store, was celebrated with bunches of balloons, violinists and politicians preening for cameras. But today the store on Alabama Avenue is Southeast is abuzz for another big event: Someone bought the only winning ticket for a $144 million Powerball prize there. A D.C. Lottery van was parked on the sidewalk in front of the Giant this morning. About a dozen helium filled balloons greeted shoppers just inside the grocery’s automated doors. The community has been abuzz over the news of the winning ticket, said Mark Ortega, the store manager. “With these economic times, we’re really glad the winner is probably coming from this community,” he said. The winning ticket bears the numbers 1, 6, 48, 52, 56 and the Powerball is 9. Officials do not know the name of the winner, who has not come forward. “The D.C. Lottery is very excited that the grand prize POWERBALL jackpot ticket was sold in the District,” Jeffrey “Jay” Young, executive director of the D.C. Lottery, said in a statement. Powerball began in 1985 and is played in 29 states, the District and the U.S. Virgin Islands. The record jackpot was $365 million won by eight workers at a Nebraska meatpacking plant in February 2006. Currently 30 states, the Virgin Islands and the District of Columbia participate in the Powerball Lottery. Unfortunately the District of Columbia hasn’t had a Powerball jackpot winner in almost ten years. This area use to have jackpot winners every once in a while especially during the 90’s, but around the year 2000 this area ran into a cold spell. My co-worker and I use to talk about this Powerball jackpot drought in D.C. But now things are looking up. Someone around here finally won. Congrats to the lucky winner!!! Posted in: Powerball	| Tagged: D.C. Lottery, Giant Food, life, Powerball Lottery, Southeast D.C., Washington D.C. The winners from the August 25 Powerball drawing have finally come forward. They won my money, lol!!! The winning jackpot ticket was bought in Indiana by a family of three from Ohio. I was checking out the Powerball site last week and noticed that the winner still hadn’t claimed that jackpot. 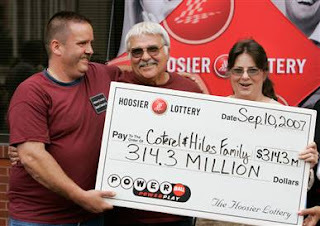 INDIANAPOLIS — A family of three from Ohio came forward on Monday to claim a massive $314.3 million Powerball jackpot from a drawing more than two weeks ago. David Coterel, 65, a retired auto worker, and his two children, David Coterel Jr., 42, and Lynn Hiles, 46, bought the winning ticket. They plan to take the cash option, worth $146 million. After taxes, that would be about $105 million. Coterel Sr. said he is retired from General Motors. Family members drive each week from the Dayton, Ohio area just to buy tickets. Hiles said she quit her postal worker job in Dayton, while her brother recently took a buy-out from his job at a Delphi auto parts plants. I would have lost it too from all the excitement of winning that amount of money. And like his kids I would definitely quit my job. Congrats to the Coterel family!! Powerball is played in 29 states, Washington, D.C., and the U.S. Virgin Islands. The record jackpot was $365 million won by eight workers at a Nebraska meatpacking plant in February 2006.